He said: "Can I go to Petrol Station with Mr. Smokeypants? Rob of Independence Brewing is in town and I want to show my support." I don't often drink beer at bars, but when I do, I prefer bars those that appreciate craft beer. The metrics for determining great beer bars are mostly subjective, but that is not to say there are not specific criteria for consideration. Environment. If the place is too loud, too stuffy, too corporate, or too chochy then I'll pass. I'm not picky about seating types, but let's agree that there has to be something available. I don't care if it is a rock, a beat up resale store wooden chair, or an L-shaped bench; I'm going to need something. Memo to lounge chair and couch bars, if I have to hold my sweating pint glass the entire night because there is no place within arm's reach to set my drink, I'm a little less comfortable. Call me lazy, but I don't want to be doing crunches all night during my session. B-M-C-U-L8R. If the draft or bottle list is chock full of Bud/Miller/Coors produced or distributed products, then I'm not impressed with your beverage "management." I'm going to assume that you are also slacking off on proper storage and serving too. It is probably worth mentioning that even though a ginormous draft wall is impressive, a bar with three unique and/or local drafts with a beer engine is many times more attractive to me. I'll argue that even your average curious beer drinker will find my second scenario more appealing. Provisions. Food has to be available, or now I need to plan on going to two places instead of one. Your ability to nail the first two items on this list will determine how good your food needs to be in order to still be a great beer bar (in this person's mind). Bars that are comfortable and have great beer can get away with a cheese tray and pretzels on the menu. Bars with uncomfortable seating layouts need to have Asian-fusion eggrolls or something. Anyone in between should have burgers or sandwiches. Menus full of frozen foods that are re-warmed in the microwave or tossed in the fryer are noticeable to the customer and generally not appreciated. Petrol Station is in the top tier of beer bars using any credible set of measures. Owner Ben Fullelove has created what may be the best neighborhood bar in the Houston area. I even think Petrol Station would be a great place even if they didn't serve beer (but that is not a suggestion). Sure Ben may be a brownie eating, godless, hippy that acts like he owns every place he walks into, but Petrol Station is great nonetheless. Tonight wasn't my first time to Petrol, but it just reminded me again of how much better this place is than (for example) a BW3. "Fritz Maytag, owner of San Francisco's Anchor Brewing Company, is regarded as the godfather of the craft brewing movement. Fritz agreed to guest brew this very special ale with us in honor of our 30th anniversary. As a nod to the robust black ales that seduced both Fritz and Ken in the early years, we bring you this Pioneers Stout, a rich and roasted ale, perfect for aging, and worthy of your finest snifter. Enjoy!" Serving the beer, it is impossible not to notice it is thick, very black, and has a huge brown head. I instantly knew this beer would be wasted on my "She Said" partner. Getting dangerously close to a foamy clown nose, I could smell only burnt chocolate and roastiness, which masked any hop aroma for me. I was surprised on my first few sips at the significant amount of hop flavor that I managed to detect in this roast bomb. The beer goes down relatively easy, but leaves the palette with a roasty/burnt flavor that doesn't go away until it's washed out. I expected the beer to have malty sweet taste and aroma due to its high gravity, but very little sweetness was detectable. As the beer warmed, more chocolaty tones were noticeable. The roastiness never mellowed. I have a 2nd bottle of this that I will save for quite a while with the expectation that this will improve as the flavors mellow and profile becomes more complex. 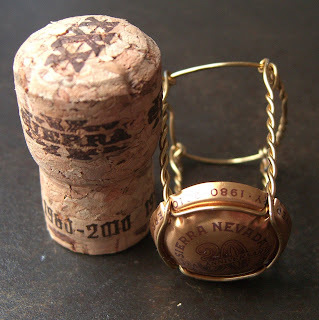 Sierra Nevada: Cheers to 30 years! This beer reminds of when my Mom used to cook bread when I was a child. Burnt. My homebrewing "He Said" partner may have an appreciation for this type of stout, but I've never ate something that was all burnt and thought, "hey, this would make a good beer!" 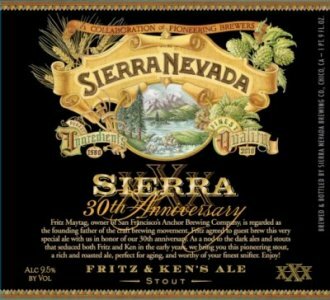 I'll probably pass on any future offers of this iteration of Sierra Nevada's 30th Anniversary Ales in the future. My enjoyment of stouts is limited to tastings with chocolate and Independence Convict Hill Imperial Oatmeal Stout (yum!). As an Independence investor, if 25 years from now they served me this beer, I'd be pretty disappointed. Just saying. My thoughts on the flavor profile: Burnt roasted malts, hint of hops, and smooth foamy head. If you limit your drinking on a "school night," skip this bottle. I give it a 1½ hops out of 5.